With Ian Vincent's map of India, it's a country full of different colours and peoples waiting for you! 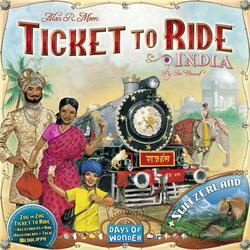 It is 1911 and the world is changing within the British Raj. Will you be able to achieve all your goals in time, or will your opponents be faster and smarter than you? Also includes Alan R. Moon's Swiss board, designed specifically for 2 to 3 players and made famous by the Ticket to Ride Online game! Discover the green valleys and mountains of Switzerland, while tasting the charms of neighbouring countries.